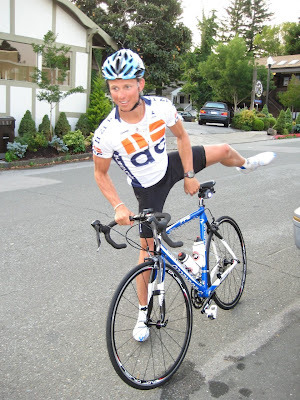 Jeff P. came to us having never ridden a road bike before. Already a talented runner (he just finished the world famous Double Dipsea footrace with the fastest time this year), he wants to compete in Triathlons. We discussed his needs and budget and set him up with Pinarello's FP-2 road bike. The FP-2 is an aluminum frame with carbon seat stays and fork, and arrives fully equipped with Shimano Ultegra components and Pinarello's MOST wheels. The tube shaping and paintwork are beautiful, with a lot of trickle-down technology from Pinarello's $5,000+ framesets. Ready-to-ride, the FP-2 came in just a touch over $2,000. Jeff didn't have any hesitation about taking his new bike for a spin immediately. Chad explains how clipless pedals work just moments before Jeff heads out. Enjoy, Jeff!